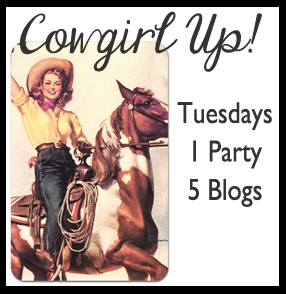 Home by Ally: Cowgirl Up Linky Party & Guest Hosting! Ally from Home By Ally! Hi! 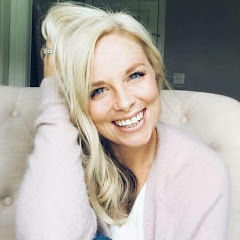 I'm Ally from Home by Ally and I am SO happy to be here guest hosting for The Ivy Cottage and the Cowgirl Up Linky Party! What an honor! These ladies are such a great inspiration and I am truly grateful for the opportunity to be here and sharing my passion with y'all! 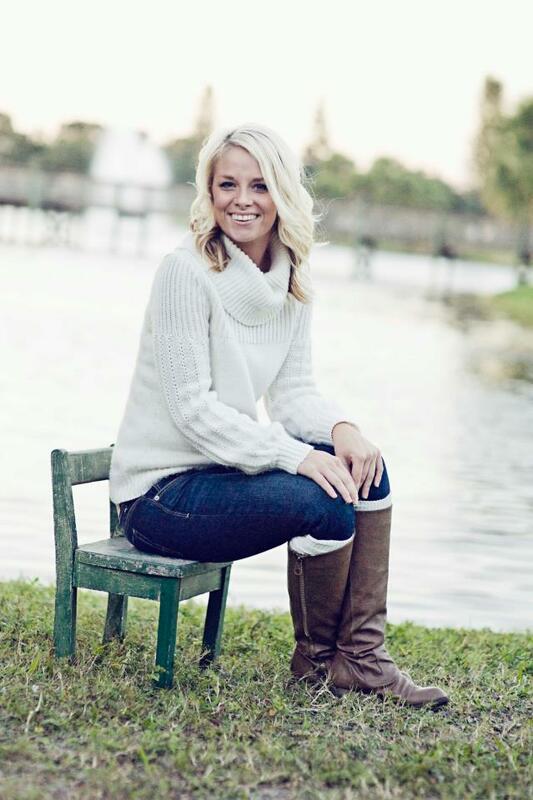 Home by Ally started roughly a year ago with a serious passion for all things pretty. 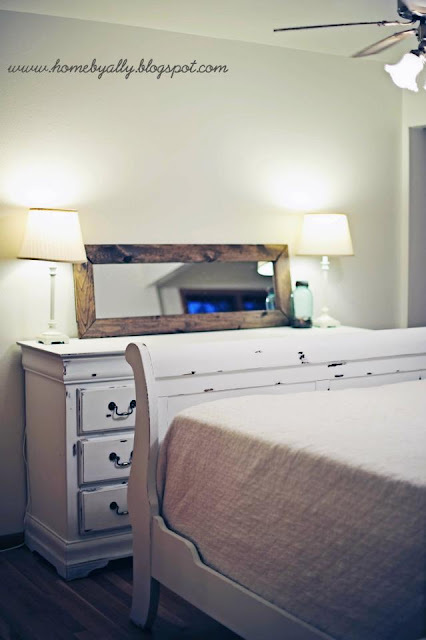 I have always had a love for home decor and repurposing the old and new, furniture included. My great uncle, grandmother & mother have always been insanely into home decor with my uncle owning his own interior design business in North Carolina. My little family and I just relocated to eastern Florida on account of my husband serving our country in the military. Since we are military and have lived in many houses that the military provides for you, I've always had to be creative with mostly white walls, cheap finishes and outdated looks. I'm so excited to be here in Florida and I hope to be here for awhile and get Home by Ally involved in the community and the local people! 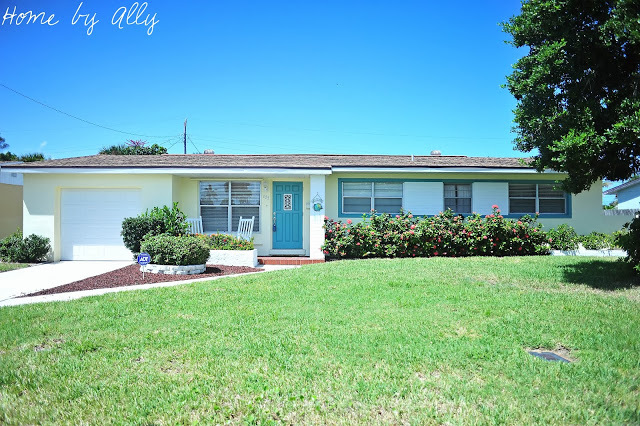 Here are some of my favorite projects to date here at Home by Ally! One of my first favorite projects was this cute little DIY Painted Mason Jar Soap Dispenser. So adorable and so FREE. 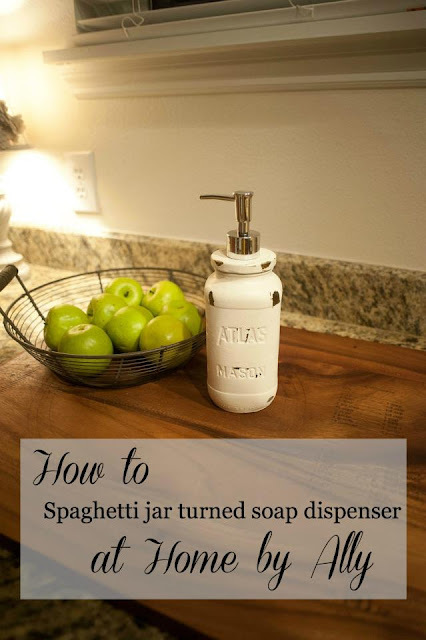 It was made from a spaghetti sauce jar and I had the lid on hand from another dispenser! You can find the link by clicking here! 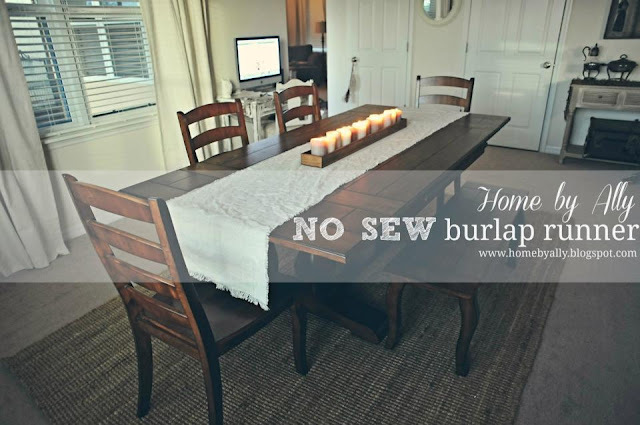 One of my most recent projects was this DIY NO SEW Burlap Table runner. We had just purchased the new farmhouse table and I need a custom runner over 100'' inches long! I couldn't find what I was looking for without paying an arm and a leg so I decided to make my own! You can find the link for my DIY no sew burlap runner by clicking here! Next up was just from a week or so ago, this cute little lettered picture frame that I keep seeing pop up on Pinterest! It cost me $3 whole dollars to make! 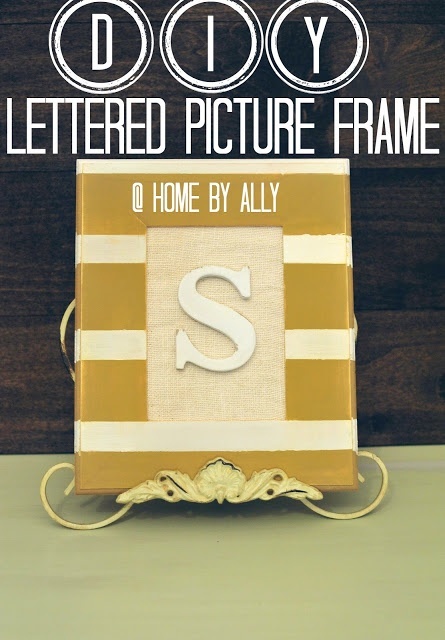 You can find the link for making your own lettered picture frame by clicking here! While we were stationed in North Dakota, I really wanted a new bedroom set but we didn't' exactly have thousands to spend on one. So, I painted ours! You can see the master bedroom furniture reveal by clicking here! And finally, one of my most FAVORITE projects to date was my custom DIY Nailhead Trim (Pottery Barn Inspired) Headboard! I still can't believe I did it on my own with only a trip to Lowe's. Yes, seriously. 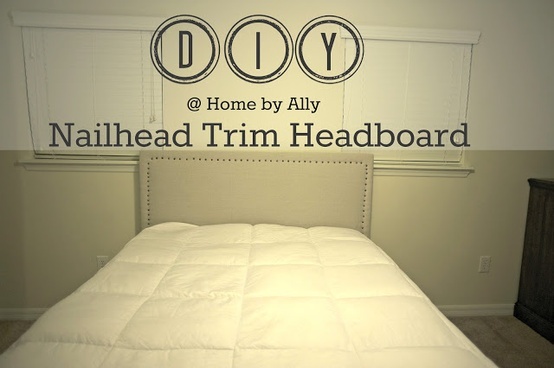 You can find out how to make your own Nailhead Trim Headboard by clicking here! ** Want to be a Guest Host here on Cowgirl Up? Just leave a comment with your name and blog address below! If you are selected, you will be introduced in the Cowgirl Up post for that week, and we'll include a link to your blog. We’ll send you the code for the party ahead of time, so that’s a post you don’t have to write. Lots of fantastic exposure for you, and the post is written for you! On to this week's features chosen by Amanda with The Ivy Cottage Blog! I am a sucker for vintage makeovers and this little desk is one of the sweetest I have seen in quite awhile . . . by Do You Love Him, Loretta? Love this teen room makeover by Remodelando la Casa! Truly something special! 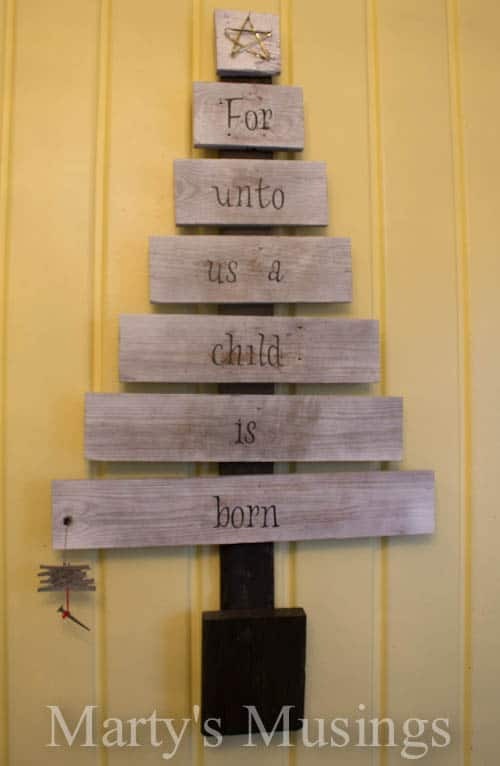 A scrapwood Christmas Tree by Marty's Musings! Recycled Christmas Card Tree by The Enchanting Rose. 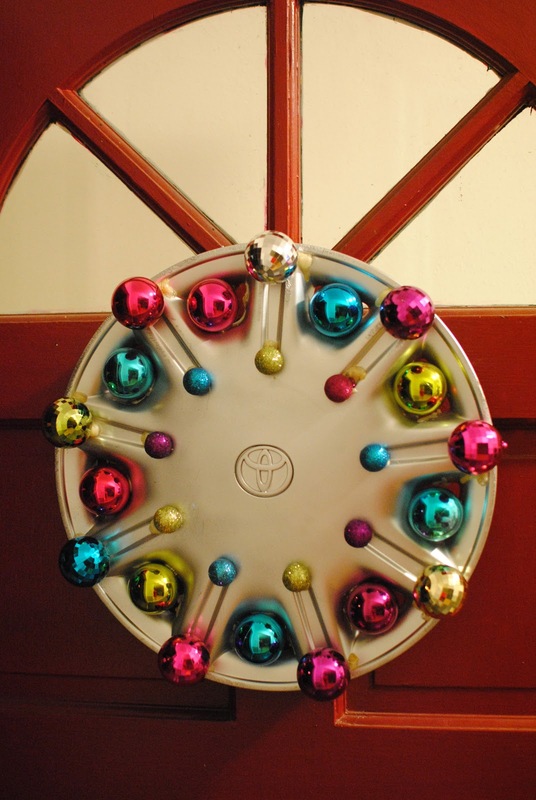 This fantastic Hub Cap Wreath by I Still Hate Pickles. Now about this week's party... You link up on my blog and your link shows up on FIVE blogs. It was so nice to meet you through Cowgirl Up! I just wanted to let you know that because of the holidays we won't have a cowgirl up party again until Jan 7. The reason I mention it is because I am leaving the link party up for two more weeks. If you want to send people to the party, you it will be open until I think Jan 6. Merry Christmas. So creative! Still it’s tough to move so much and remake every time you are in a new place. I’m very curious about how much time do you need to rebuild new place to fit your tastes? Moreover, how do you feeling when it’s time to leave place you remade so beautiful. When I worked thesis writing service on writer job, I was kind of devastated after every paper I finished to deliver. Because I felt like I gave part of myself.